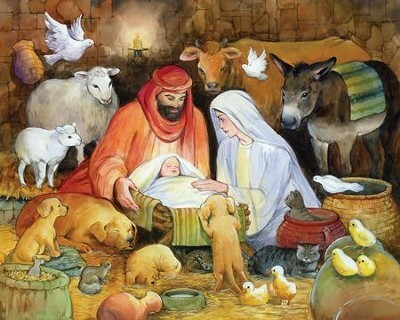 Mary and Joseph enjoy the company of the stable animals as they gaze upon the newborn King. Traditional Nativity scene embellished in glitter with 25 windows to open - one for each day of Advent; each window reveals miniature artwork and Scripture reference highlighting the birth of Jesus. Easy to hang or display anywhere; measures 11.75" x 8.25". I'm the author/artist and I want to review Adoring Animals Advent Calendar.